One of the most exciting things about the inbound pair of Pokemon Let's Go games is that they're an amazing recreation of the much-loved Pokemon Yellow: Pikachu Edition. It was basically the third game in the series, like ever, and played on the idea that you were your very own Ash Ketchum, complete with buddy Pikachu that followed you around. Obviously with Let's Go, you get the choice of having Pikachu or Eevee as your buddy, but that nostalgia factor is still there. That extends to the fact that Pokemon Let's Go lovingly recreates the entirety of Pokemon Yellow's storyline (although I'm sure there will be a few extras along the way, in true Game Freak style), which means you might want to start planning for its release... in Pokemon Go. From launch you'll be able to trade Pokemon from Pokemon Go to Pokemon Let's Go (although not the other way around, I might add) to add to your Go Park, which seems to be Pokemon Let's Go's version of the Safari Park from the original game. Any Pokemon you trade from Pokemon Go will live inside the Go Park, and you can go there and attempt to catch anything you find to add to your Let's Go Pokedex and general collection. Interestingly, although you might think that Weedle is a pretty common (and rather rubbish) Pokemon, it didn't actually feature at all in Pokemon Yellow as a catchable creature. Instead, you had to trade with Pokemon Red or Blue to get yourself the little caterpillar guy, and all his evolutions. I've always found Ekans and Arbok a fairly rare occurance in Pokemon Go too, but it turns out that in Pokemon Yellow you couldn't catch them whatsoever, so you might want to start stockpiling the scaley duo for trade as it's looking likely you won't find them in Let's Go either. If you're playing Pokemon Let's Go Pikachu, it's probably going to be fairly tricky to find a Raichu as your buddy Pokemon won't evolve. However, we have seen some Viridian Forest gameplay from Let's Go Eevee on the old Youtubes that suggests you may be able to catch a Pikachu in the wild and train it up to evolve into Raichu. 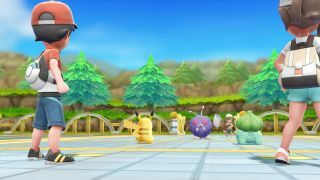 Whether you'll be able to get it in Let's Go Pikachu has yet to be confirmed. Of course, the added complication of Alolan Pokemon being available in Pokemon Let's Go may mean that this could change things a little, because Alolan Raichu does exist. It's not yet clear how Alolan Pokemon will appear in either Let's Go title aside from trading them from Pokemon Let's Go. It's definitely worth keeping a spare one in Pokemon Go (both original Gen 1 and Alolan) just in case though. Now here's where things get confusing. Meowth and Persian weren't available in the original Pokemon Yellow adventure. However, it's now been made clear that Pokemon Let's Go Eevee will have Meowth as one of its exclusive Pokemon, meaning you'll be able to evolve it into Persian. But if you're planning on buying Pokemon Let's Go Pikachu, you'll want to make sure you've got a Meowth in your back pocket to trade there. Like Meowth beforehand, Vulpix is another Pokemon Let's Go Eevee exclusive, meaning you'll be able to catch this little fire fox in the world if you're rocking Eevee as your buddy. For the Let's Go Pikachu players though, you'll want to nab an extra Vulpix for your party in Pokemon Go before Let's Go arrives. The third and final Pokemon Let's Go Eevee exclusive Pokemon is Bellsprout, and thus Weepinbel and Victreebel will also be Eevee-lusives. That means, yes you guessed it, anyone who's planning to rock the Pikachu edition of Let's Go will want to pocket a Bellsprout via Pokemon Go before their copy arrives. So, now you may be wondering what the Pokemon Let's Go Pikachu exclusives are, and your first is the little leafy delight that is Oddish - and his slightly less delightful evolution Gloom, and then the back-to-being-cute-again Vileplume. You'll only find Oddish and co in Let's Go Pikachu, so Eevee owners will want to grab an Oddish or two in Pokemon Go ahead of time. The second of the Pokemon Let's Go Pikachu exclusives is Sandshrew, and its evolution Sandslash. You'll need to grab one in Pokemon Go if you want one in Eevee, or find a friend with Let's Go Pikachu if you want to complete your Pokedex with this little desert dweller. This is the one that really swung me onto Pokemon Let's Go Pikachu - the adorable fire dog that is Growlithe, and thus Arcanine, it's equally cute evolution. These are both exclusive to Pikachu, so those crazy Eevee buyers are going to want to make sure they've got a few spare in Pokemon Go. Back to the old unobtainable ones, rather than just game exclusives I'm afraid. In Pokemon Yellow, you couldn't catch Koffing at all, and therefore Weezing too. It's unknown whether that'll be the case in Pokemon Let's Go, but it might be worth tucking a few of these poisonous balls away just in case. Interestingly, the electric beast that is Electabuzz wasn't actually featured at all in Pokemon Yellow, meaning anyone who wanted to score that elusive 151 comlete Pokedex would need to trade with Red and Blue players to snag him. I'd advise doing it in Pokemon Go instead. Much easier. That being said, Electabuzz is actually rather rare in Pokemon Go too. Originally it was a Pokemon that you could get from a 10km egg, but that's not an option anymore. Instead, you'll have to hope it pops up as a random spawn, or that you hatch an Elekid in a 5km egg. Like Electabuzz, Magmar is another Pokemon you're not going to find in Pokemon Let's Go, according to our history with Pokemon Yellow. Instead, you're going to have to trade one from Pokemon Go, and that's also becoming quite the hard achievement. Magmar used to be a potential 10km egg hatch, but now it's been reduced to random spawns, or an evolution from Magby, which you might get out of a 5km egg. The last Pokemon you might want to try and hunt down in Pokemon Go ahead of Pokemon Let's Go's release is Jynx. This psychic Pokemon was an absolute no-show for Pokemon Yellow, so it's looking unlikely it'll appear in Let's Go. Try and snag one in Pokemon Go. It'll be a random spawn, or you can try to hatch a Smoochum from a 5km egg and evolve into Jynx from there. Looking for more Pokemon to trade into Pokemon Let's Go? Here's how to catch a Ditto in Pokemon Go and which Pokemon are on the Pokemon Go shiny list.